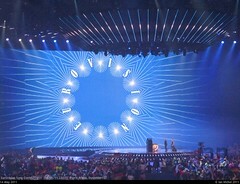 Eurovision Song Contest 2011, a photo by ianxn on Flickr. But now Alex Salmond faces perhaps the biggest threat his dream of Scottish statehood. For the country’s first minister has now been warned that, if it opts for secession, Scotland might not be allowed to enter the Eurovision Song Contest. The annual song contest is run by the European Broadcasting Union, and a spokesman said it would require the Scottish broadcaster to re-apply for entry once it leaves the Royaume Uni, as our country is known at Eurovision. Application involves a complicated list of criteria they would have to meet – and Scotland would not be guaranteed admittance. Kosovo is not able to enter the song contest, in part because of the opposition of Serbia, the country it seceded from six years ago. After Kosovo’s independence in 2008, the national broadcaster Radio Televizioni i Kosovës (RTK) applied for membership in the EBU (European Broadcasting Union). Membership of the national broadcaster in the EBU is the prerequesite for a Eurovision participation. However, in order to become a member of the EBU, the broadcaster first needs to be a member of the International Telecomunications Union (ITU). And there we have the problem: In order to become a member of the ITU, the country needs to be a member of the United Nations. As Kosovo is still not recognised as an independent country by many countries, for instance Russia, Serbia and Spain, it is not a member of the UN. It sounds extremely unlikely that Scotland wouldn’t be accepted as a new member by the UN, given that independence will have been won through a democratic process agreed with the UK. Kosovo’s problems seem to have been caused by the fact that new member applications can be blocked by the permanent members of the UN Security Council (the US, the UK, France, Russia and China), and Russia have decided to block Kosovo’s application (because they’re friendly with Serbia). It’s thus actually irrelevant whether Spain would be happy with Scottish independence or not (and they have said repeatedly they don’t have a problem with it so long as independence has been achieved through constitutional means). It also seems very unlikely any of the permanent members of the UNSC would want to cause any problems. In short, it’s practically certain that Scotland will quickly become a member first of the UN, then of the ITU and finally of the EBU, after which Scotland will be free to participate in the Eurovision Song Contest.